Interesting. I am an immigrant child of refugees. An atheist, with a compassionate, libertarian point of view. We can tell from your compassionate rhetoric and positions. Are you familiar with the terms? "You didn't help those poor, miserable, completely neglected and dying people correctly" is NOT part of compassion. I've asked repeatedly, with no response, to show how my fact of the use of unsterilized needles is incorrect. NO ONE has denied that they were used. That is a fact, not conjecture. Right? More proof, that like jeff, like Eusie, like Viz -- you simply do not get it. I'm NOT disputing your "facts." I'm saying when measured against the good she accomplished, especially when so heavily burdened by depression and doubt, your "facts" don't mean diddly. Except to a self-blind fundie. Thank you. That took a bit to get to. I have a lot more compassion for those that suffered, or those that were caused to die because of the lack of proper care, which was available to them if they had been referred, than I have for a jet-setting fund gatherer that then used those funds for what purpose? She filtered them to her religious order, NOT to the afflicted. That IS a fact, and not disputed. How can you endorse that? cupper, the woman is dead. She did some good things and some not so good---just as you and I do. I've already agreed she isn't a saint, but then, in my book, there are NO saints, period. What you are doing with this thread on MT and the previous one over on Religion and Spirituality is nothing more than trolling, pure and simple and quite visible for regular posters, monitors, and visitors. Find some live christians worth bashing. I may even help you, and I am a believer, but this thread is as much deserving of closure as the other one. You share the same sandbox as Eusie, jeff and Viz - you just play in a different corner. Made me laugh, today, and I really needed it. So where is your proof she was a jet-setter who lived high on the hog? Of course, she gave the funds to her religious orders who were doing the work, who else should have gotten the money? The people she helped were dying and no amount of intervention could have saved them. Do you know what a hospice is? If they weren't dying they would not have been there. So you would rather have them die in the street? So where is your proof she was a jet-setter who lived high on the hog? Bottom of the page, just above her picture. Newsweek article, behind a paywall, but we can read it in the first paragraph. On numerous occasions she used Keating's private jet, he who was convicted of fraud. Of course, she gave the funds to her religious orders who were doing the work, who else should have gotten the money? 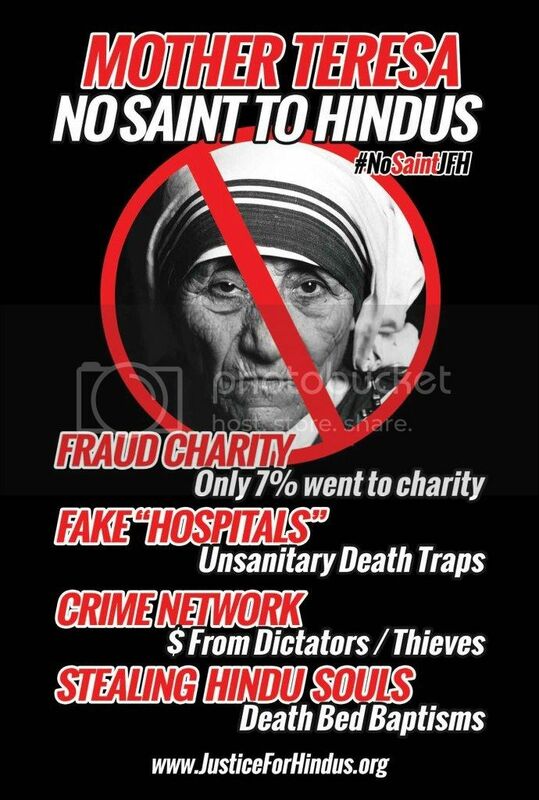 In early 2000, Susan Shields, a former Missionaries sister who left the organization “unhappy”, created a furor by saying she herself had “written receipts of $50,000″ in donation but there was no sign of the “flood of money.” Forbes India talked to a volunteer in the Los Angeles office of Missionaries of Charity who admitted that “even when bread was over at the soup kitchens, none was bought unless donated.” A report in German magazine Stern, revealed that in 1991 only seven percent of the donation received at Missionaries of Charity was used for charity. Former volunteers and people close to the Mother House revealed that the Vatican, home to the Pope, has control over the “monetary matters” ever since Missionaries of Charity came under its fold in 1965. The control got stronger after Mother Teresa died in 1997. You too are adulating the image, not the reality. Seems a few Hindus have an opinion of Teresa of Kolkata. Now, one would think Hindus in that area just might know a thing or two. Their article is, shall we say, concerning. No, I don't think the people over there liked her. She put the spotlight on their ignoring the poor to let them die in gutters.